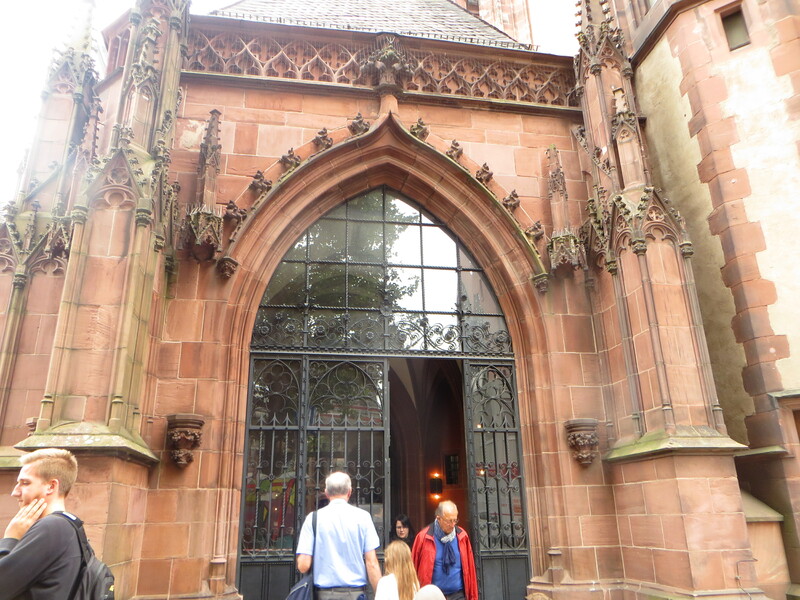 The metal and glass doors belong to St Bartholemew’s Cathedral in Frankfurt, also known as the Frankfurter Dom, and the original church on this site was constructed many years ago, in the 14th and 15th centuries. 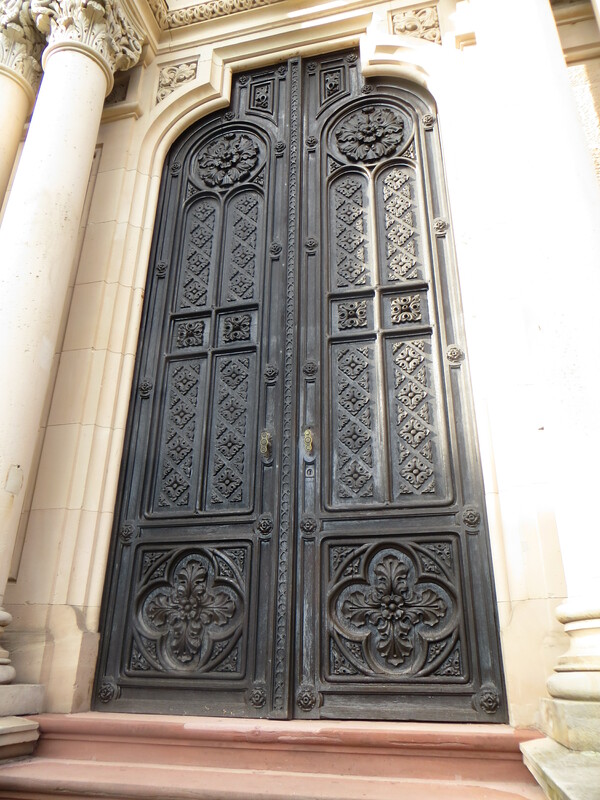 These very ornate doors are from the Russian Orthodox Church in Weisbaden, also in Germany. The church itself is also very highly decorated, with golden turrets on top, which sparkle in the sunlight. To check out more interesting doors, head on over to Norm’s place. 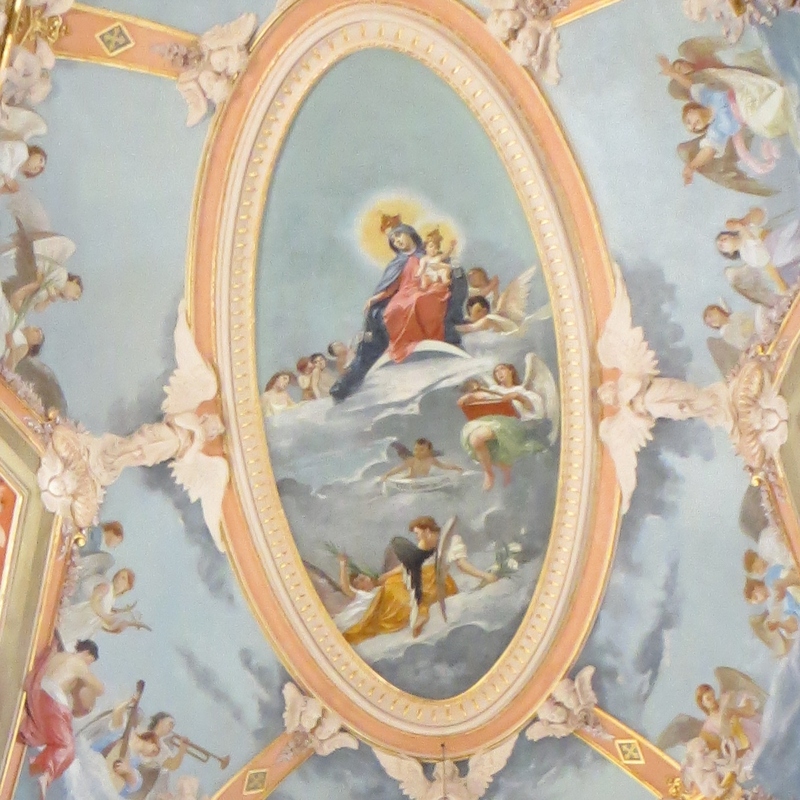 Today I have two contrasting photos, the first one of the ornate ceiling of a church in The Silent City, Mdina, in Malta. 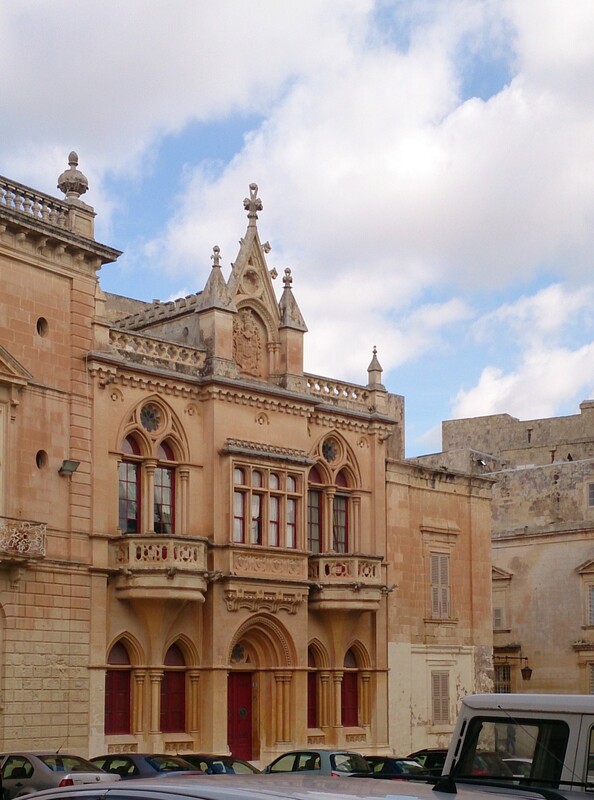 Malta has many churches, and each one is more beautiful and ornate than the one before, most of them are works of art in the baroque style, (late 16th century) full of carved ceilings and gold leaf, and beautiful paintings. And now, for something completely different …..sheep grazing in a meadow. This is something you can see anywhere in Ireland, in fields and on the mountain sides. Often the sheep graze on common ground, and so that the farmers can identify their own sheep, they put a mark on their wool with a special, long lasting, marking paint, (each farmer chooses his own colour) so they make a colourful sight on the mountain! Malta is a small island in the Mediterranean, south of Sicily, and like its neighbour Italy, it is mainly Catholic, and the locals tell us that there are 365 churches on the island. Everywhere you look there is a church or a dome of yet another church, and you can hear church bells morning and evening. The church above is dedicated to St Paul, who was shipwrecked in Malta, and is a symbol of the great devotion the people here have for St. Paul, with many churches and places dedicated to him. 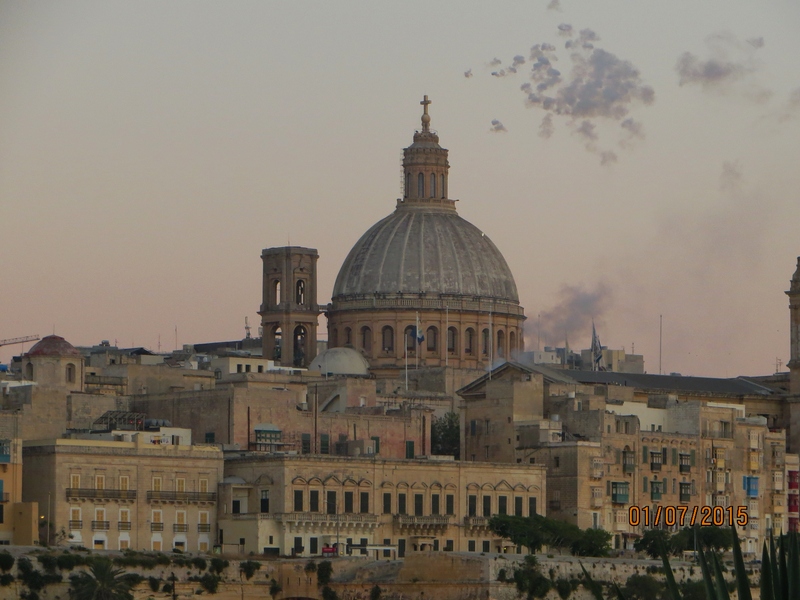 This photo was taken at dusk, when there were fireworks over the church, you can see the smoke in the air. 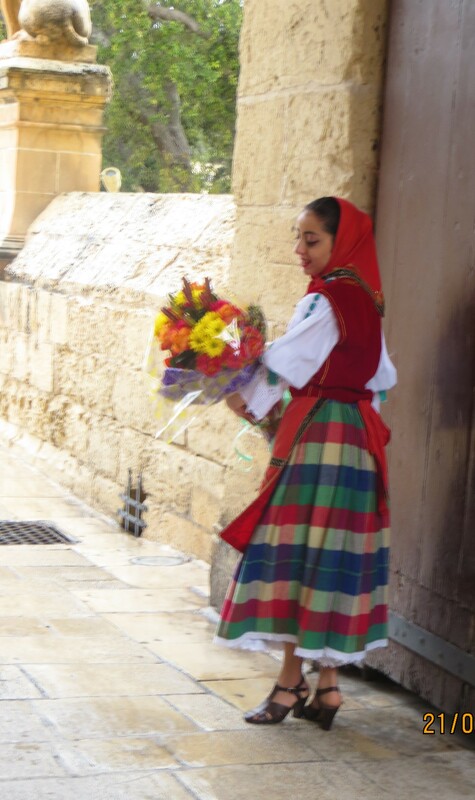 Anyone who has visited Malta will be familiar with the fireworks and festas, which take place in some village or other every weekend, to celebrate their patron saint’s feast day. When we were flying into Malta a few days’ previously, in the darkness there was a spectacular display of fireworks below us as we came in to land – I think they were put on to welcome us to Malta!! 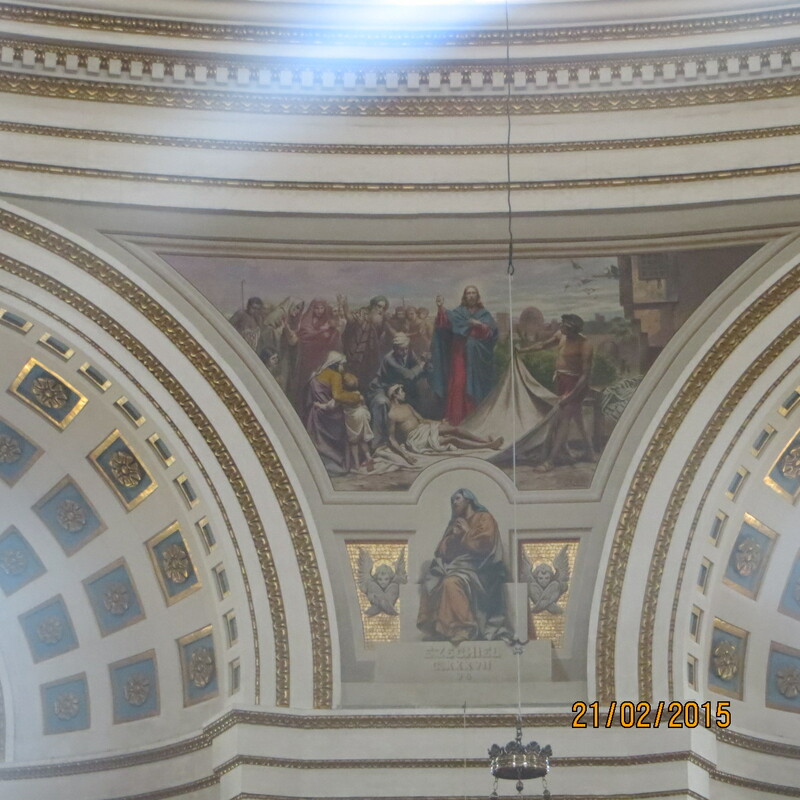 My second church is another symbol of Malta, and Valletta, the Church of our Lady of Liesse, in the Grand Harbour. It has a special meaning for us as my daughter got married there last week, so to us it will always be a symbol of love and happiness, and our whole family (usually scattered all over the world) were together in one place to celebrate. One day we hope to go back there and remember that magic week. 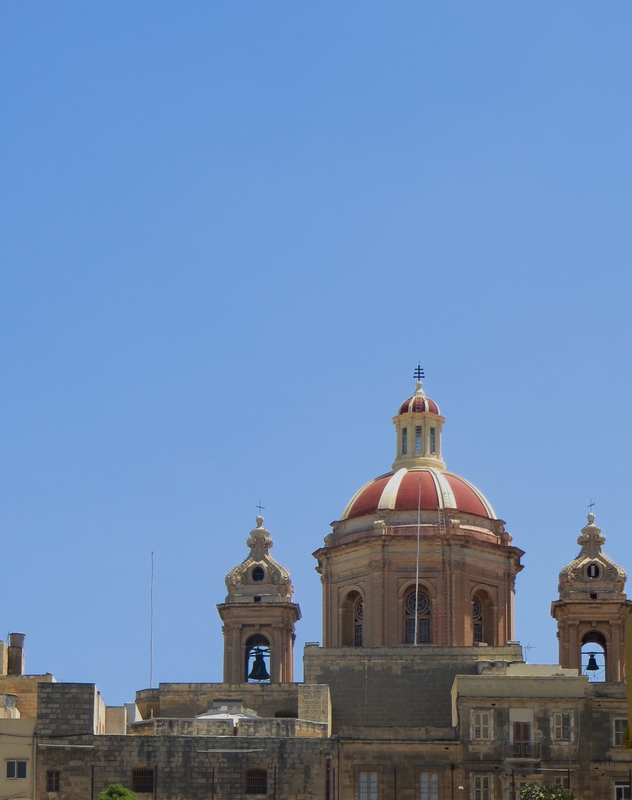 Mosta Church in Malta is one of the many very ornate Baroque churches scattered all over the island. 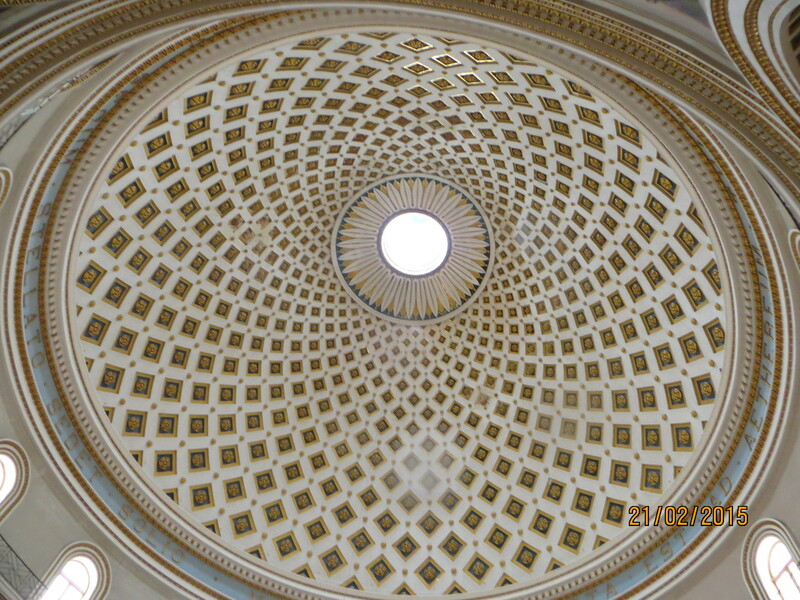 This church is a major tourist attraction because of its dome, which is the third largest unsupported dome in Europe. The design is very intricate, as you will see, and must have taken a long time to construct. On April 9, 1942, during an afternoon air-raid, a SC500 kg general purpose Luftwaffe bomb pierced the dome (one 50 kg bomb bounced off) and fell among a congregation of more than 300 people awaiting early evening mass. It did not explode. 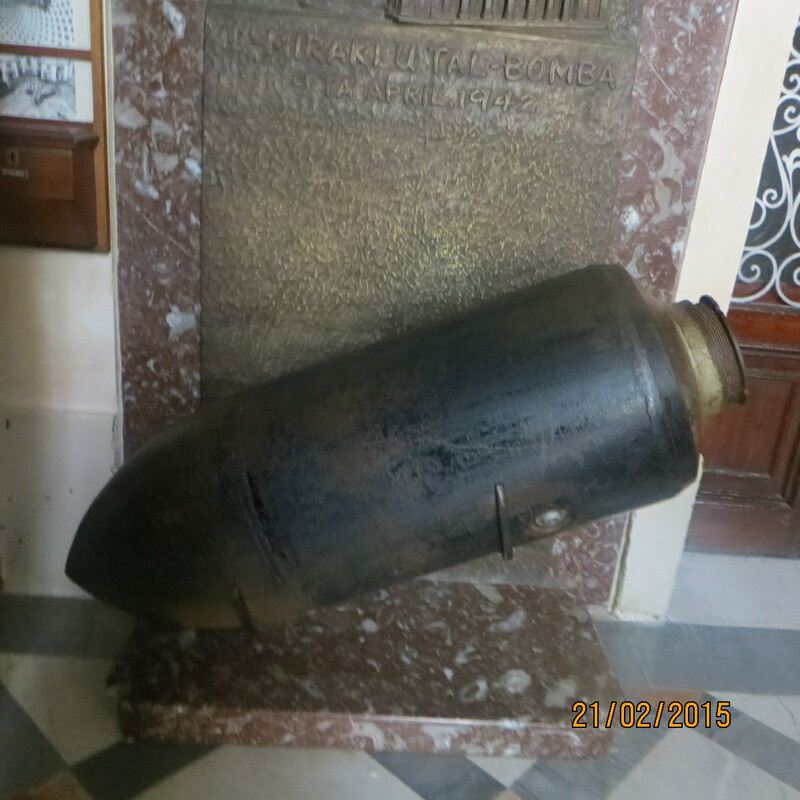 The same type of bomb as pierced the dome is now on display ( the original was dumped at sea) at the back of the church in the Sacristy. 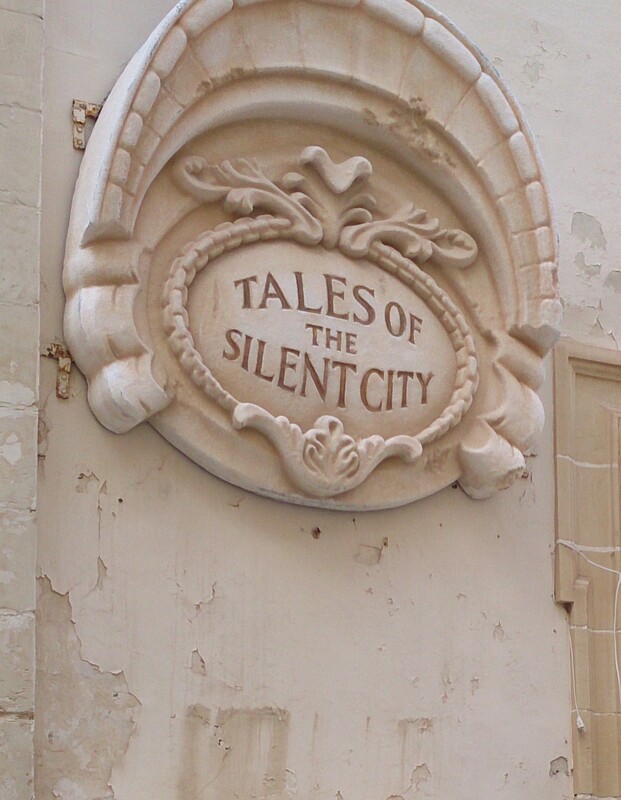 Welcome to the Silent City, this is the old walled city of Mdina in Malta. 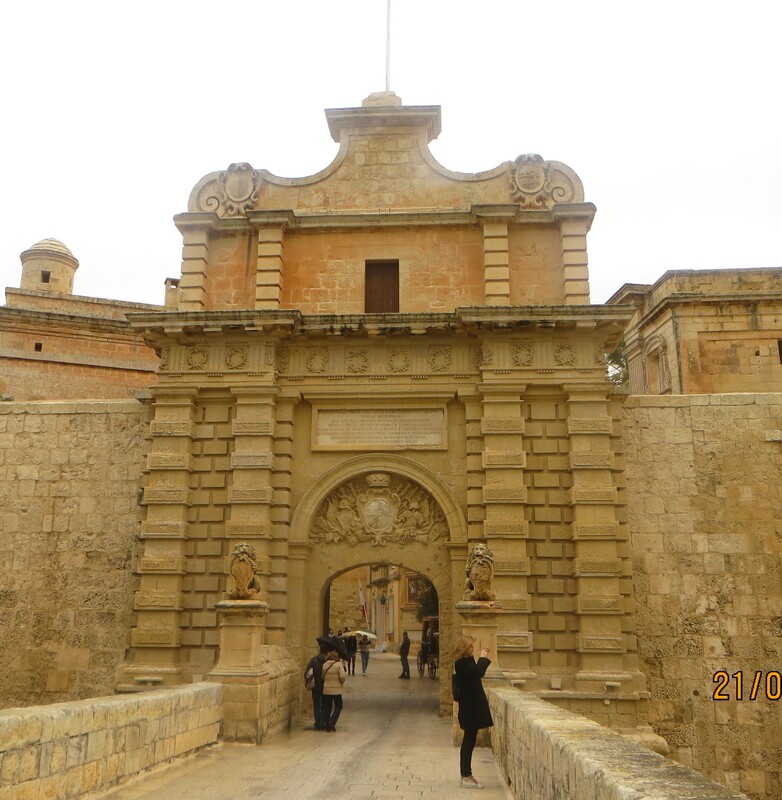 Mdina is the old capital of Malta, and its origins can be traced back to 1500 BC. It has also been called the Noble City, and is called the Silent City as practically no cars are allowed within its walls, the only exceptions are the traders that operate within the walls, and brides getting married within the city. The only entrance into the city is through the gates shown above, and if you don’t fancy walking around, you can be taken over the bridge and through the gates by horse and carriage. 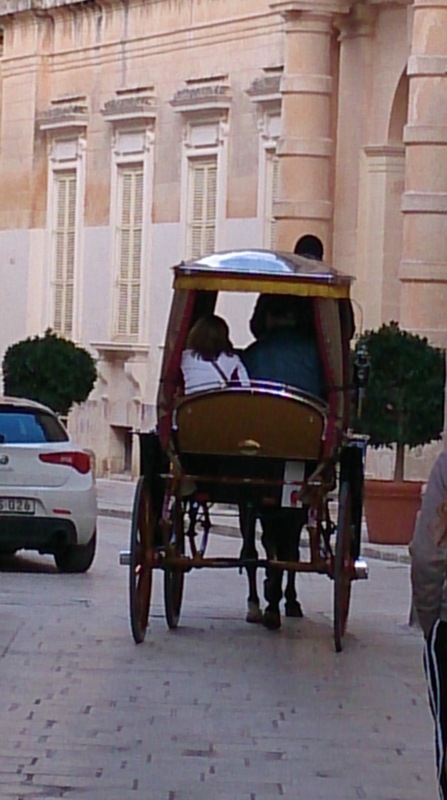 Impressive palaces line its narrow shady streets, and Mdina is one of Europe’s finest examples of an ancient walled city, with a mix of medieval and baroque architecture. 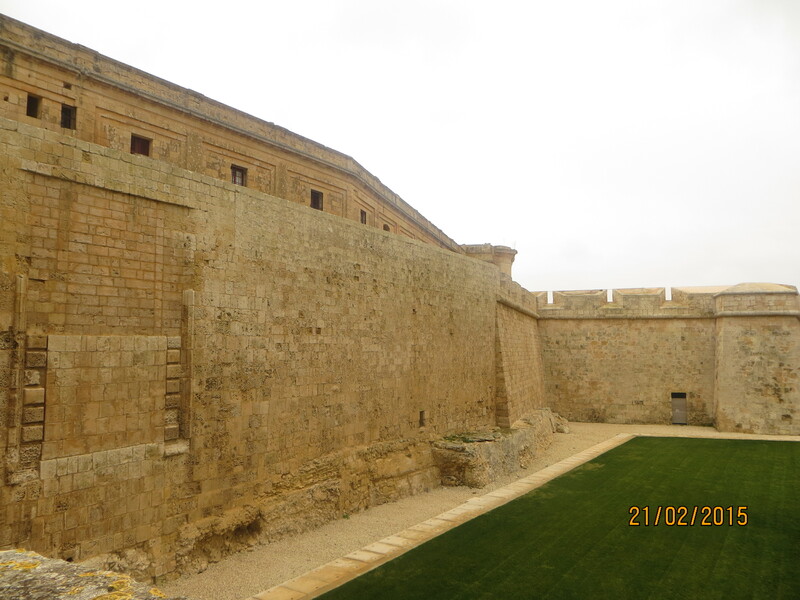 Also within the walls is an impressive cathedral, and a beautiful Baroque church (there are so many Baroque churches in Malta, and they are all spectacular), and some lovely old restaurants and converted palaces. 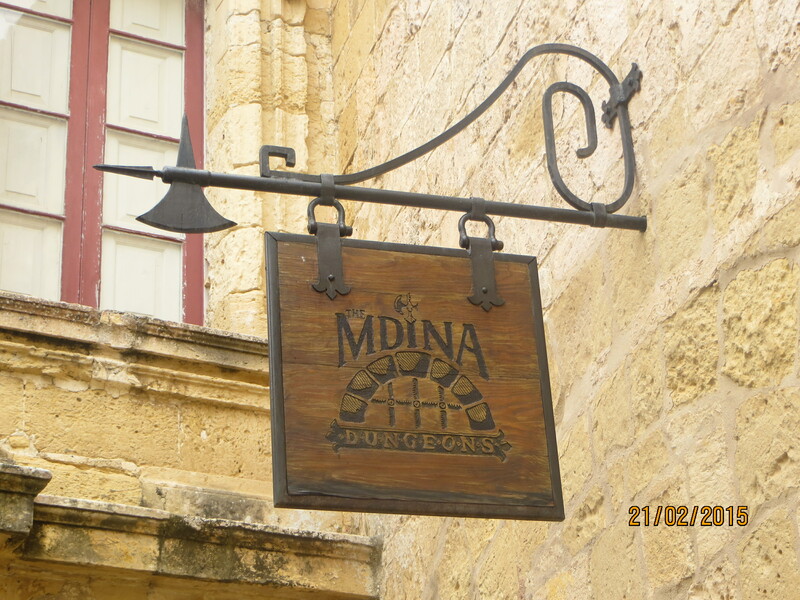 While we were there, we also visited the Mdina Dungeons, “Malta’s only Museum of Crime and Punishment” and I must say that I definitely did NOT enjoy the more gruesome scenes there – the flyer says “Ancient history blended with startling realism will reveal stories too dramatic to be believed”…the sights and the sounds were pretty scary, and the cruelty shown by the Romans, the Arabs, and even the Knights of old was all pretty gory stuff and was very well presented and realistic. Is it someplace you would like to visit? Malta is a beautiful, small country, with many places to explore, and it’s easy to get around and to see all these wonderful old buildings full of history.